Tom Mason talks Exiles and Ultraverse! 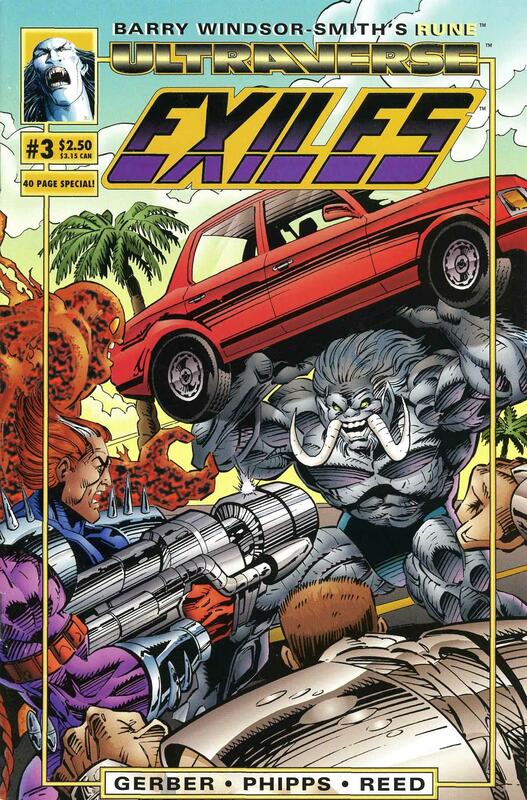 Based on house ads, Exiles wasn’t intended to be a part of the Ultraverse upon its creation. When and why did that change? Was Steve Gerber involved from the start? TOM: Exiles was created long before the Ultraverse and had nothing to do with Steve. What happened was that Dave Olbrich, Chris Ulm and I started kicking around ideas for a super-hero team book that would be owned by Malibu Comics. 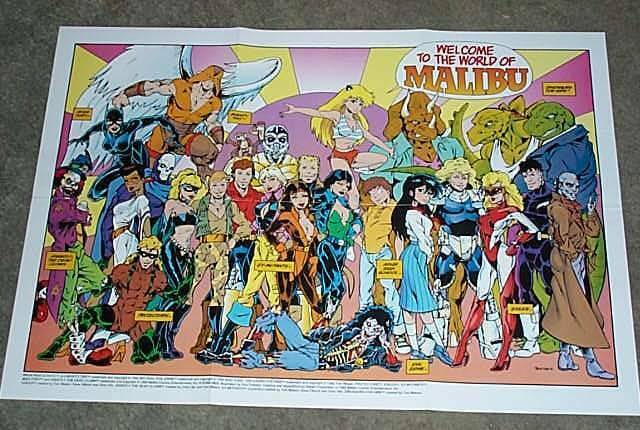 Almost all of the titles that Malibu had published up to that time had been creator-owned and Scott wanted a couple of properties that the company had claim to. We’d thought we’d create one, so every Monday night for many weeks, the three of us would go out to dinner at a Mexican restaurant near the office and just brainstorm, make notes and start writing a script. We’d kicked stuff around, Chris had point for the first part and would write things up during the week, then we’d get together again, pass around pages and write, tweak and rewrite and brainstorm some more. And eat nachos. We finished the first issue’s script, and hired Paul Pelletier to pencil the entire issue. While that was going on, we did a few company-based promotional things – a poster, a promotional postcard, a two-pocket folder, stuff that could be used as presentation pieces for licensing and merchandising. If you’ll notice, a lot of properties shown in the material were not owned by Malibu – Ninja High School is there, Evil Ernie, Dinosaurs For Hire were all creator-owned. The idea was just to make the company look more appealing to other corporate entities. Since Exiles was in the works, and we assumed it would be part of something in the future, we stuck them in there. If someone saw Exiles there, and somehow, magically wanted to develop it as a movie or TV show, then that would’ve spurred actual publication faster. Steve Gerber didn’t get involved with Exiles until at least a year after the first issue had already been pencilled and lettered. What happened was we were all sitting around the conference room at the original Ultraverse Founders Conference in Scottsdale in October 1992. On the first day, everyone was pitching around stuff that they’d always wanted to see in comics. Steve threw out that what he’d like to see was to have a character really die and stay dead, and prove it by cancelling his book. And do it all without telling anyone in advance. By the end of the conference that weekend, Chris, Dave and I decided that we should take Steve’s random thought and match it up with the Exiles that had been sitting on the shelf. Chris sent all the material to Steve once we got back to the office, and the two of them batted around some ideas for how to make it work, and to have Steve rework a few of the existing pages from issue #1 while keeping as much intact as possible, and then develop the story over issues #2-4 so they all could die in the last issue. The idea only worked because Exiles had never been published as a comic book. If the series had debuted back when we originally wrote it, we would never have suggested bringing it into the Ultraverse. Things would’ve turned out quite differently. After everyone agreed to graft Steve’s thought to the Exiles, and then killing them off, the trick was just keeping it secret. Back then, as now, books are solicited months in advance and if we stopped soliciting Exiles after #4, everyone would know the book was ending. We didn’t want that. People would start focusing on reasons for the cancellation, and it wouldn’t look right to be cancelling a book so early after the launch of the UV and revealing the truth behind it could spoil the surprise. Also, we didn’t want anyone to know that the characters were going to die. We wanted the shock. We wanted the surprise. We wanted people to see that things about the Ultraverse were different from what they were used to – we’re willing to kill off characters from our launch, cancel their book, and keep them dead. Of course, the only way to keep it a secret is to lie. Pretend like the book is ongoing, make no mention of the death anywhere for any reason, tell only the people in the office who need to know, and write fake solicitation copy for issues #5 and #6 to keep up the pretense. What was Steve Gerber like to work with? Was he a big influence on you and the other Exiles creators before you guys worked in comic books? TOM: Steve had been recruited as an Ultraverse Founder by Chris Ulm and Dave Olbrich. Both of them (as I had been) were huge fans of Gerber’s work on The Defenders. We wanted a guy who could take the tropes of super-hero comics and spit them out in a new way. Steve had a clever, inventive mind. He’d been around enough to know what DC and Marvel had done in the past, and he was always pushing to acknowledge that and twist it around to make something different. It was remarkable to sit in the same room with him and kick stuff around. At the Founders Conference, I really pissed him off. Back in his early Marvel years, he had created a character called Doctor Bong in Howard The Duck. And even though he had a bell-shaped head to go with his name, Doctor Bong debuted in the late 1970s. Steve swore to me that the name was not a not-so-subtle drug reference, that it really was a bell reference. And I wouldn’t let it go. I was convinced he was rewriting history so he didn’t get called out by crazy politicians or whatever. I eventually dropped it, and it was all good. The thing about Steve though is that he just couldn’t keep a schedule. It was always like pulling teeth to get him to turn in a script. He always needed money and we always needed pages and those two forces rarely met on the appropriate day. One time, he was so far behind in writing the dialogue for a pencilled issue of Sludge, but needed money so desperately that we had him come to the office and work with the understanding that at the end of each day he could walk out of the office with a check for each page he completed. We were always advancing him money for work he was promising to deliver. I think by the time Sludge was cancelled, he still owed us a script and we never called in the marker. Deadeye does not appear in the house ads for Exiles that indicated they would not be part of the Ultraverse. When was he created? TOM: It’s funny what people take away from what they see. Deadeye was part of the original script that Chris, Dave and I wrote. He was in there from the very beginning and was created by us at the same time as the rest of the characters. He just didn’t make it into the house ad. He was probably left out for space reasons. 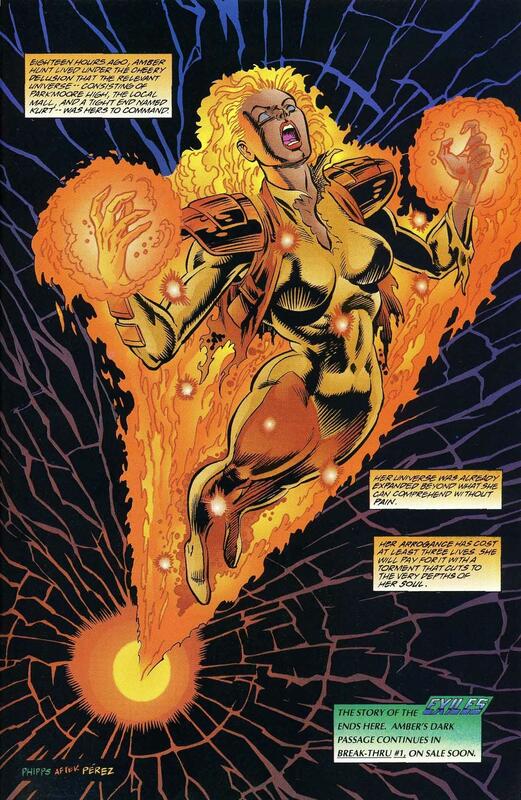 Amber Hunt goes on to be an integral part of the Ultraverse, as she is the catalyst for the Break-Thru crossover. Was that planned from the start? How did you feel about her character? The creators did a great job making me both love and hate her. How did you feel about creating a team to die? Did it bother you at all? TOM: Well, they weren’t originally created to die. The timeline is this: Exiles #1 was created and written by Dave Olbrich, Chris Ulm and myself. It was going to be a stand-alone superteam book, not connected to any universe and we assembled the story bible and wrote the first issue’s script sometime in early 1991. And hired Paul Pelletier to pencil it. He completed the pencils for the whole first issue. Then we got busy with Image, then the Protectors came along, and then the Ultraverse. And all this time that first issue of Exiles just sat on the shelf, waiting for the right time to release it. But it kept looking unlikely that based on the way the market was at the time, a stand-alone super-hero book was the right idea. We shelved it until we could figure out what exactly to do with it. What about the portrayal of how hapless these heroes were? Was it hard to go against the grain of heroes generally be really good at everything? TOM: That goes back to our original concept for the book. At the time we were developing it, Chris, Dave and I knew that the market probably didn’t want, and wouldn’t respond to, an independent super-hero team that was really good at what they did. There were tons of those already. We needed an angle, something different. Far better to go the other way – make them hapless, give them a learning curve and still have it go badly. Steve took that and ran with it, of course. Exiles #5 was solicited, but you guys knew it would never be made. I am assuming that retailers got their money back, but did any of them give you any flak, anyhow? TOM: I think both Exiles #5 and #6 were solicited in order to keep the secret from getting out, but there were no refunds because no money changed hands. Retailers don’t pay when they order – they only pay when a book ships. So since neither issue shipped, retailers weren’t out any money, so refunds weren’t necessary. We caught some flak from the distributors because cancelling books that weren’t going to ship creates extra paperwork that someone has to handle. Most people were cool with it because once you realize what happened, everyone knew it was the only way to pull off a trick like that. 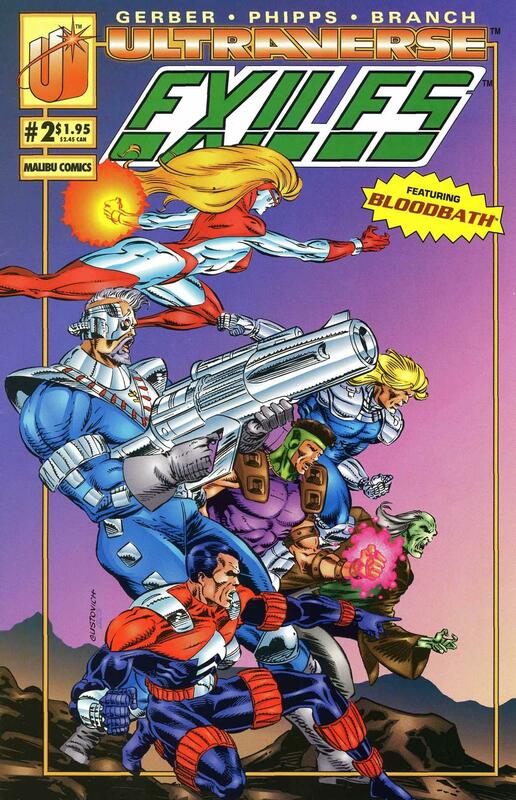 Would Exiles have been part of Malibu’s Genesis Universe if it had not been part of the Ultraverse? Would the Exiles have suffered the same fate? TOM: The Protectors universe was developed before the Ultraverse, and the Exiles was in development before The Protectors so we had the chance then to add it to the Protectors, but chose not to. The Protectors was really designed to be a reboot of the old public domain heroes from Centaur that originally appeared in the late 1930s and early 1940s. Exiles didn’t fit that narrative. 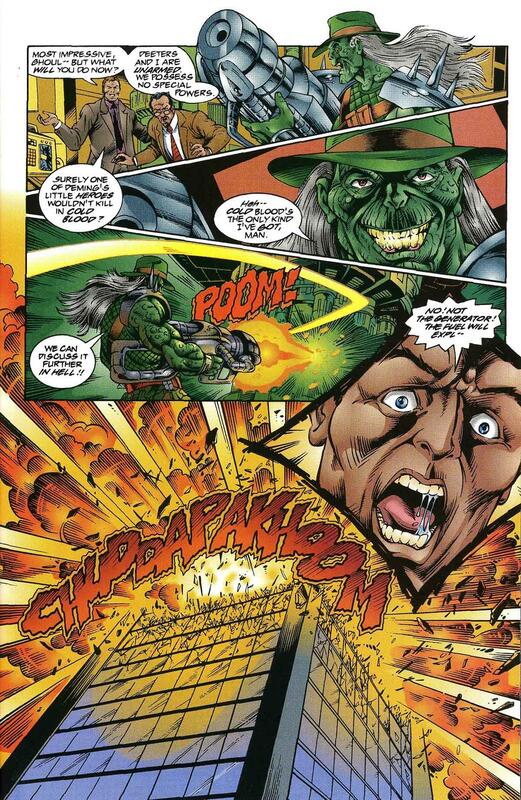 Had we forced the issue and put Exiles into the Protectors Universe, it’s doubtful they would’ve died because the idea of killing a character and cancelling his book came from Steve Gerber at the initial Ultraverse Founders conference in 1992. Dave, Chris and I were the ones that offered up Exiles at that time. The death of the Exiles is one of the more spoken of events in the Ultraverse. Does that surprise you? TOM: Not really. We knew it would be a big deal, at least we hoped it would. We weren’t just killing off characters, we were making a statement about the UV itself. We were going on record by saying we weren’t bringing them back, and we cancelled their book the second they died, and that if we’re willing to do this with an early launch title, then is anyone in the UV really safe? If you bring back Dinosaurs for Hire, you’ll let your buddy Dean know first so we can break it at the only 90’s comic book website out there, right? TOM: Oh yes. They are coming back. It’s just a question of when. -Thanks again, Tom for taking some time out of your day to talk 90’s comics, the Ultraverse, and Exiles with us! Looking forward to the return of Dinosaurs For Hire!